Sri Lanka’s retail space is expanding rapidly with two new malls having opened recently and more poised for launch in the next year or two. A frenzy of construction activity in the city’s prime retail hubs creates a sense of excitement – about new retail spaces and sector prospects. But despite the gloss and glamour, the reality is that the retail sector isn’t necessarily performing up to expectations. “Some retail sectors are cyclical in nature when long-term key performance indicators (KPIs) are analysed – generally a high period of two to three years and likewise for lows, which could be considered cyclical. Having been in a downturn for some time, perhaps we might witness an upwards movement next year,” he adds. 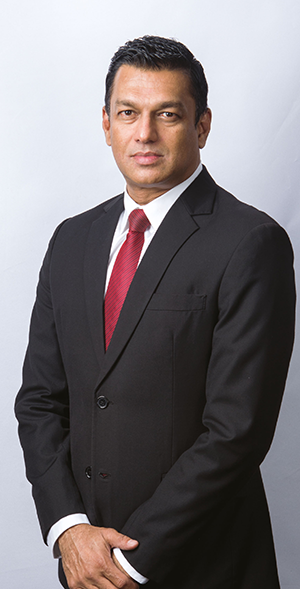 RUPEE DILEMMA In an underperforming economic milieu, the devaluation of the Sri Lankan Rupee poses serious difficulties with the cost of sales increasing and margins eroding. “Every retailer faces the dilemma of whether to pass the full impact of this onto the consumer or absorb it. Price increases affect sales volumes, margins and profitability because consumers prioritise spending. With limited income – and the price of staples such as fuel, transportation, and essential goods and services increasing – nonessential purchases and replacements will be delayed,” Wijewardene surmises. The sector faces daunting challenges as it has a relatively high cost base and expends substantial sums on infrastructure, manpower, logistics and operations. “Maintaining minimum margins too becomes a challenge as competition is intense. Web malls and online sellers with low-cost bases have added to the competition,” he adds. “Brands are introduced due to local franchise partners displaying an interest – rather than brands wanting to be present in Sri Lanka of their own volition. Except for a small and Colombo concentrated upmarket urban segment, Sri Lankans have yet to reach the income or spending levels to afford international brands,” he insists. “The government must offer its full backing to the sector and view it with long-term consistency to ensure lower tariffs especially for hand carry items, and promote the destination internationally through airlines, hotels and tourism. It is difficult in the current context because funding is a serious concern,” Wijewardene emphasises. TREND TRACKER The top three retail segments are supermarket chains, fashion and clothing, and consumer goods. And consumers seek a one stop shop. Large format stores with more choices, speedy payment options such as touch and pay, and the younger generation adopting new ways of shopping through technology have taken over. Sri Lanka is gradually moving in this direction with visible efforts made by retailers in many segments. However, sluggish economic conditions and policy inconsistencies are obstacles to retailers investing in new features. Although global trends have reached Sri Lanka, they remain slow in their uptake. “We also expect demand to rise with the population shifting to major urban centres and moving away from rural life, an increase in apartment living and the existence of large-scale development projects in the country. When a country evolves from one level to the next, organised retail does benefit,” Wijewardene notes. 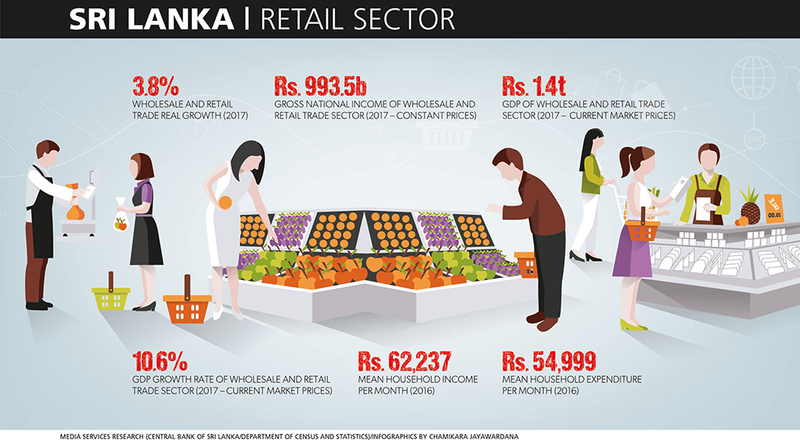 Sri Lanka’s retail sector is primarily driven by domestic consumption and when disposable incomes grow, domestic consumption is expected to surge and benefit the retail sector – all of this however, is subject to where the nation heads in the aftermath of the recent constitutional crisis.